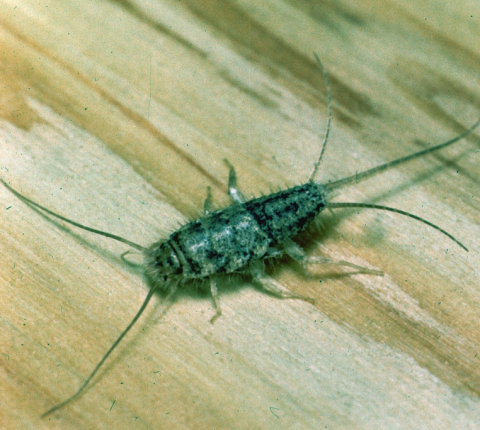 Silverfish are wingless, crawling insects which grow up to 13 mm long. It has gray to greenish color scales along the length of its carrot-shaped body. The silverfish has two long antennae, six legs and three long antennae-like appendages extending from the tip of its abdomen. The firebrat is a similar insect which is up to 8mm long. The silverfish is a tropical insect that has adapted to living in houses and other structures. 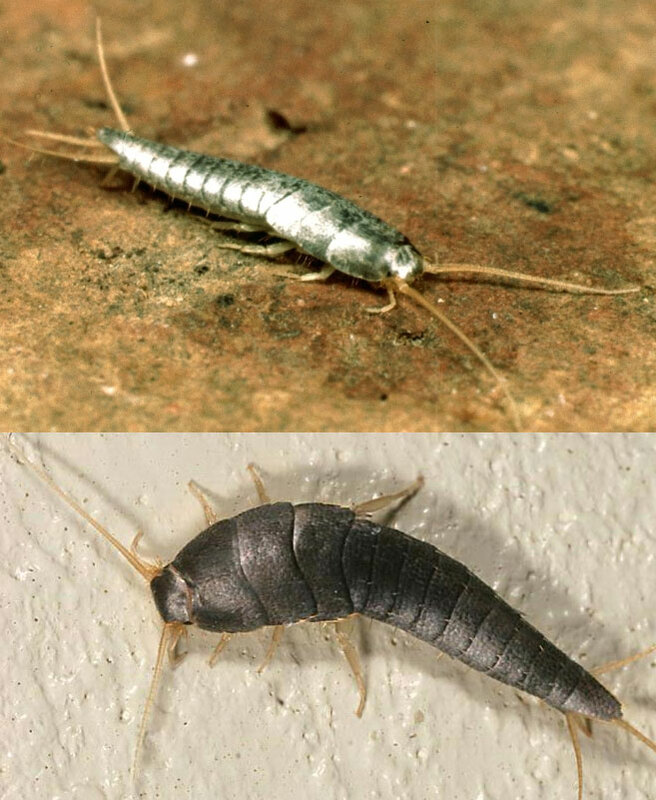 It requires warm, moist locations in the structure (silverfish: 20° – 28° C; firebat: 38° C), preferring to hide in cracks and crevices during the day and emerge at night. It can be found throughout the house, from basements to attics, and also can be found outside under siding, shingles, and mulch in gardens. The silverfish feeds on books, cloth, glues and pastes in wallpaper, labels and paper products. The female silverfish lays 1 to 3 eggs per day in cracks and crevices, and the eggs hatch in about 43 days in a warm, humid environment. Young silverfish look exactly like adults, except smaller, and can live for more than 3 years. Silverfish can survive for weeks without food or water. Siverfish require moist locations, so it is important to reduce humidity and moisture. Repair leaking faucets and other sources of moisture. Sanitation is helpful, but will not eliminate the pest since silverfish will feed on a wide variety of paper products. Regular vacuuming in cracks and crevices will reduce particles on which silverfish feed. Sticky traps (glue boards) can be used to trap the insect in areas where silverfish are common, such as bathrooms, basements and laundry rooms. A pest professional will conduct a targeted treatment which will greatly reduce the silverfish population in your home.